Anritsu Corporation has announced that Anritsu’s New Radio RF Conformance Test System ME7873NR and 5G NR Mobile Device Test Platform ME7834NR has been chosen by the Samsung Electronics Quality Assurance Lab (SEQAL) quality assurance unit of the Samsung Electronics for its future 5G NR Mobile terminal certification business. Moreover, combination with the CATR chamber now in joint development and an RF converter covers the 3GPP-specified 5G frequency bands both sub-6GHz and mmWave including spurious measurements. 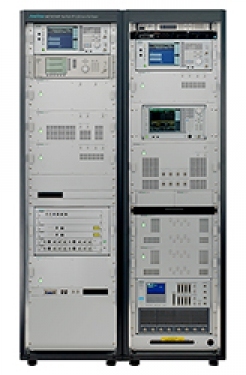 ME7873NR: The New Radio RF Conformance Test System ME7873NR is an automated test system for 3GPP TS38.521 compliant 5G NR measurements. With design support for both 5G NR standalone (SA) and non-standalone (NSA) modes, combined use with the 5G over-the-air (OTA) chamber (CATR) covers the 5G frequency bands including the sub-6 GHz and mmWave bands. The flexible system configuration can be tailored to measurement conditions and an upgrade for 5G is available from the ME7873LAsupporting RF and carrier acceptance inspection tests for LTE,LTE-Advanced (LTE-A), LTE-A Pro, and earlier W-CDMA mobile terminals, helping customers to configure a cost-effective RF test system matching all their requirements.